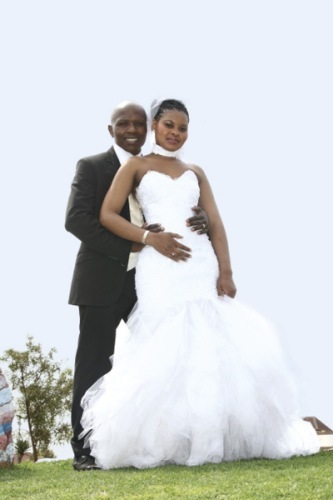 Popular boxer Vusi Malinga ties the knot with his long-term girlfriend Phumzile Motha in a fairytale wedding. WOMEN, men and children of all ages pace up and down inside a house situated on Motloung Street in Katlehong. Some carry pots and are preparing food for the reception while others are feverishly putting final touches to their outfits. Dark clouds drift about the township in the East Rand, but they’re not enough to dampen the spirits of the guests gathered for the wedding. After much fussing with make-up and accessories, a young woman emerges from the house. Phumzile Motha is a sight to behold in a white mermaid-style wedding gown. The fitted strapless dress features beading starting from the low-cut neckline to below the knees where ruffles take over.